Rachel Marie Blasingame was a straight A, National Honor Society student as a junior, at Mesquite High School. Rachel shared her talents through her appreciation of music, theater, and her concern for others. She played the viola in the orchestra and planned on singing with the Mesquite High choir. She was a thespian, winning awards for her work in theater. Rachel also was a member of the American Sign Language Club. Her true talent was realized through her selfless desire to help other people. Rachel was a leader in her church youth group at Valley Creek Church of Christ and she attended summer church camps. Rachel loved being involved in youth retreats, devotionals, and attended mission trips with the church. Her spirit of giving included participating at Special Olympics, homeless shelters, and in children's libraries. Rachel read her bible under the covers at night and made notes in it from cover to cover. She read until the pages fell out and she had to laminate the outside pages. Rachel was involved with the Shattered Dreams program at Mesquite High. She wanted to be part of persuading students not to drink and drive. 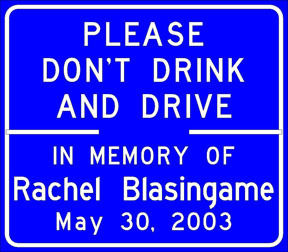 It was ironic that an intoxicated driver took part in ending her life. The Rachel Blasingame Scholarship Fund, a 501(c)3 non-profit organization, was created to assist deserving High School Seniors in meeting tuition requirements at Abilene Christian University. Each spring, a golf tournament is held to provide funds for the scholarship program. To date, these efforts have provided over $180,000 in scholarships and assisted 153 freshman to attend ACU in the 14 years since Rachel’s passing. Her spirit continues to live on by fulfilling college dreams for others.